The Miniature American Eskimo Dog is one that is a people pleaser and very loving. They are extremely eager to please and for this reason they are exceptionally simple to train as pups. While they are commonly utilized for their watchdog capabilities, it is that same trait that can cause issues when they reside in the same home setting as smaller children. They are very protective creatures and they will not welcome strangers in their home either. Smaller pets and other canines may not bond well with an American Eskimo Dog in which the owners should keep a close on the dog to ensure safety precautions are taken until they know how the dog will react. Even though this canine is a great observer and likes to ensure the safety of their owners, they are very good at actually protecting them should they engage in a physical interaction of some sort. The Miniature American Eskimo Dog is a very playful canine that will need to exert some energy during the day at some level. Playing in a fenced in yard may do the trick, but for an extra energetic Eskimo Dog, they may need a vigorous walk each day or even a run. They adore running and can do very well in cold climates as their heavy fur coats can keep them warm in very frigid temperatures. They do better in residing in a home setting versus living outdoors and they can also be entertained with any type of game they have the opportunity to be involved in. Their signature fluffy fur coats will require maintenance by grooming them at least twice per week and even more often during the months when the shed the most. A fairly healthy breed, the Miniature American Eskimo Dog is one that does not suffer from any major medical concerns as they age. They can develop CHD, PRA and patellar luxation from time to time, but not in all Eskimo dogs, just in some cases. Some additional screening the vet may recommend is to check for any diabetes that may be looming as they can tend to obtain that illness as well. Checkups for their hips, eyesight and knees should also be performed. The average lifespan of an American Eskimo Dog is from twelve to fourteen years long and they generally weigh from twenty to forty pounds when they are full grown dogs. 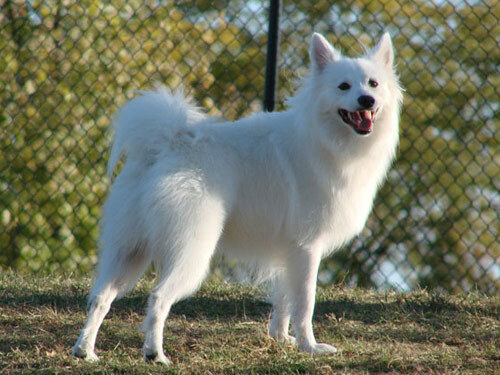 Deriving from the Spitz family of dogs, the Miniature American Eskimo Dog is one that fame did not come easy for them. They were easily associated with the Keeshond, Pomeranian and the Volpino Italiano breeds, but due to those breeds already having their own success the Eskimo dogs got lost in shuffle. Once the beginning of the 19th century came about, the medium sized white coated animals were pure breeds that were commonly favored by working class owners. They were used on farmlands and as working canines. They have since been performing dogs in the circus and have also been recognized by the AKC in 1994.